Following what this “blawg” has done in previous posts, this entry focuses on a particular nation in the context of unmanned aerial vehicles (“UAV”) – this time: the United Arab Emirates (“UAE”). Militarized connotations dominate thinking about UAVs in the Middle East — connotations that are reinforced by actual and active combat and tragedies in the region. The Middle East market for UAVs is projected around US$260 million annually and US$38 billion over the next decade, with the Middle East accounting for about eight percent of the global UAV market. Given these extraordinary economic forecasts, Sheikh Hamdan Bin Mohammad Bin Rashid Al Maktoum has announced a plan to deliver government services by 2021 by drone is as innovative as it is logical. To further this objective, the UAE has sought to incentivize local and international engineers with the “Drones for Good Award.” The initiative contemplates a two-part competition. 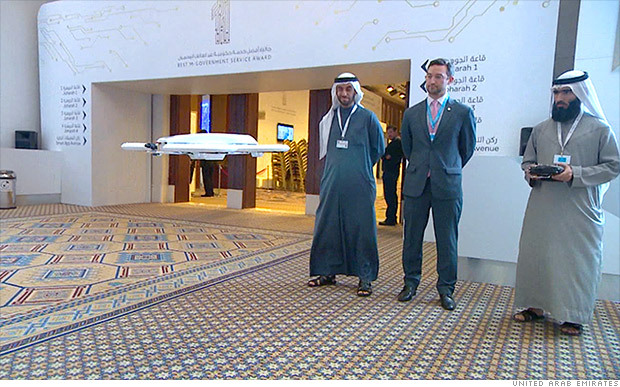 First, local UAE residents could win US$27,000 for the generation and presentation of ideas for the deployment of UAVs to facilitate the efficient and effortless delivery of various government services; second, US$1,000,000 is offered for international submissions designed to make the world a better place via small autonomous aviation platforms. Among the services and civilian applications envisioned by the UAE are disaster and emergency management; assessing the effects of floods and drought; weather forecasting; monitoring power lines, pipelines and oil spills; search and rescue missions; and policing and traffic surveillance. For example, at the Dubai International Convention and Exhibition Centre in January 2014, Dubai Civil Defense teams announced their anticipated use of “quad-copters” as “first responders” in fire detection and firefighting dousing operations as well as outfitting policing and traffic surveillance drones with Panasonic WV-ASF900 face recognition systems that can match one person out of five million faces in mere seconds. Additionally, the General Directorate of Residency and Foreigners Affairs in Dubai joined a global drone trend for document delivery, e.g., IDs, driver’s licenses, and medication. “In a first of its kind initiative, the government aims to compete with the private sector in terms of the caliber of service it provides,” the Crown Prince of Dubai said, adding that “it’s now time to use our skills and expertise to show what this government can offer, not just to Dubai, but also to the world.” This paper arises from and appraises this extraordinary goal. Posted in UAV and tagged drones, drones for good, FAA, Federal Aviation Administration, Sheikh Hamdan Bin Mohammad Bin Rashid Al Maktoum, UAE, United Arab Emirates on July 31, 2014 by Timothy M. Ravich.